How are we going documenting and photographing 2012 and has anyone done last weeks sketch. I am just about to put my photos on my paper which is pretty good for me. Don't forget to become a follower of this blog and post about "Your Life in 2012....at Divas" on your facebook page to win the beautiful We R Memory Keepers album and refills. So this week's sketch to help us with ideas for our layouts comes again from Page Maps. I think most of the sketches will be for multi photo layouts to help put one week's photos on one page. This is just a suggestion don't forget. I thought this one was so cute!!!!!!!!!!. So upload a copy of your sketch results into the divas gallery and win yourself $10 Diva Dollars by Sunday 15th January midnight. We must have at least 4 entries for the Diva Dollars to be given. I also found this blog by Monica McNeill http://withoutfilters.blogspot.com/2012/01/project-life-2012-beginning.html, which gives you ideas on how to set up your album for the year. I am actually using some of the digital elements from Becky Higgins Project Life kits which I have purchased from Jessica Sprague and then print as many out as you need. 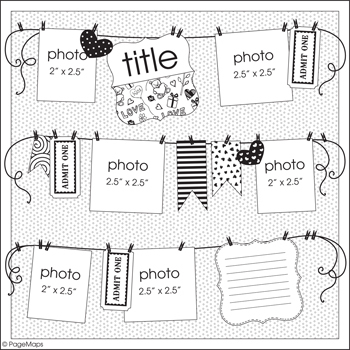 I am also using the Simple Stories Year-O-Graphy kit which can be purchased in store. They probably won't match but I don't care as long as I get it documented. As we are in summer mode in Australia anything to do with this would be great to start off with. The beach, the lake, taking the boat out, the kids swimming in the pool or at the beach, picnics, your backyard in summertime, a sunset, I am sure you can come up with heaps of other ideas.